In November 2009, the Town dedicated nearly $3.2 million in improvements to the Desert Vista Park, including lighted athletic fields, a restroom, picnic and shade ramadas, age-appropriate children’s playgrounds, landscaping improvements, area lighting, and new parking areas. The views from this park include both Red Mountain and Four Peaks, and include a Skate and BMX park, an off-lease Dog Park, lighted Soccer fields and handicapped-accessible walking paths and picnic areas. The Off-Leash Recreational Facility, or Dog Park at Desert Vista Park is one of the most-used amenities in Fountain Hills. 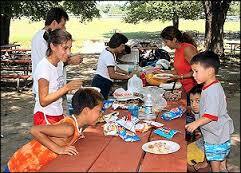 It is a 3-acre fenced facility that allows pet owners the opportunity to let their dogs run free. Dogs must be licensed and have proper vaccinations. The Dog Park is divided into 2 fenced areas, 1 for larger dogs and the other smaller canines. The large / active dog area can be accessed from entrances on either Tower Drive or Desert Vista. The small / passive dog area can only be accessed from Tower Drive. Four Peaks Neighborhood Park, located on Del Cambre Avenue near the Boys and Girls Club, is a 15-acre park that includes a youth soccer field with spectator seating, a 100-foot pedestrian bridge and walkways, picnic tables, an 18- by 24-foot ramada, a 750-square-foot restroom/control building, two lighted tennis courts, two lighted basketball courts, two multi-purpose ball fields with lights and a children’s playground. 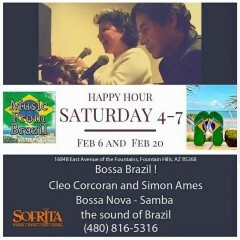 Special Saturday evening Happy Hour at Sofrita, featuring the happy sounds of Brazil. Bossa Brazil, featuring Cleo Corcoran and Simon Ames. Saturday, February 20, 2016; 4-7 p.m.